Premium quality back support belt from Proworks; designed to provide effective pain relief for the lower back by reducing pressure in the affected areas; ideal for a hernia, sciatica, scoliosis, osteoporosis and general lumbar pain. In addition to providing relief for existing symptoms, a good back support belt can help prevent injury from occurring in the first place by helping you achieve proper form and posture during your exercise workout, at work, or in general day to day life. Made from a combination of neoprene and polyester, these Proworks back support belts are strong, comfortable and long lasting; with a breathable elasticated mesh back panel that fits comfortably around your lower back to provide superb lumbar support. Features a slim, discrete design and secure, adjustable straps that allow the Proworks back support belt to be worn under clothing; making it perfect for normal everyday use. Waist Size: 25″ – 35″ (65cm – 90cm). Hand wash only. Suffering from lower back pain? Hoping to ease the effects of chronic back pain? Wanting to avoid injury from physical activity? A good quality back support belt is the ideal apparel for providing support and easing pain. Here at Proworks we pride ourselves on providing the very best in exercise equipment and accessories and our back support belt is no different; made from a strong combination of neoprene and polyester, the Proworks back support belt is comfortable, effective and built to last. 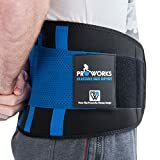 Designed with an elasticated mesh back panel and fully adjustable neoprene straps to relieve stress and strain on your muscles, joints and ligaments; the Proworks back support belt is ideal for relieving lower back (lumbar) pain, sciatica, herniated disc pain, osteoporosis, scoliosis and other injuries or conditions that effect the lower back area. Prevention is better than a cure and that saying rings true here too; rather than waiting until an injury occurs, why not avoid it to begin with? The Proworks back support belt is designed to provide correct posture support and relieve the stress on your joints, muscles and ligaments when under strain. Perfect for a wide range of exercises, sports, and work including heavy lifting, running, yoga, golf, horse riding, football, and more.